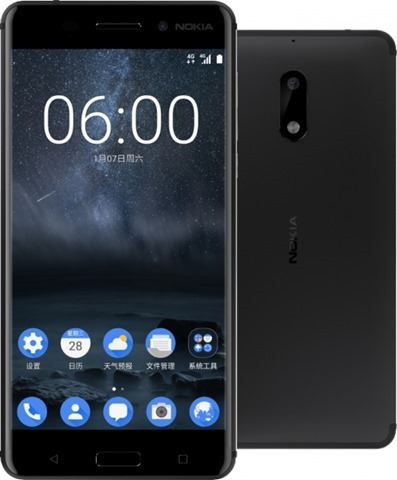 HMD Global has announced its first Nokia Android phone, called the Nokia 6, in China. The phone is the first Android powered from Nokia, since the Microsoft Nokia X series. The Nokia 6 sports a 5.5 inch 1080p Full HD, IPS LCD display which has a 2.5D curved glass and is protected by Corning Gorilla Glass. It has a pixel density of 403 ppi, sunlight reading technology, and upto 450 nits brightness. The device runs on Android 7.0 Nougat, and is powered by an Octa-Core Qualcomm Snapdragon 430 processor with 4GB of RAM and an Adreno 505 GPU. The phone has 64GB of storage and supports up to 128GB of expandable memory via a microSD card. The Nokia 6 features an aluminium unibody, with a front facing fingerorint scanner, embedded in the home button. The photography options on the phone consist of a 16.0-megapixels rear camera with an f/2.0 aperture, with phase detect autofocus, a dual-tone dual LED flash and an 8 megapixels, front facing camera, also with an f/2.0 aperture and a 84˚ wide-angle lens. The device is backed by a 3,000mAh battery which is not user-removable. The phone has dual speakers, and supports Dolby Atmos audio. The Nokia 6 has been priced at 16999 Yuan, which is around 17,000 Rs. It will be available exclusively in China through JD.com, from early 2017.